In late 2012 my wife and I were wondering aloud about what to do for our 50th birthday. A trip. A big trip. The quick consensus was Italy. Then how to get there. My wife works at a high-end retail clothier and one of her customers suggested contacting Classic Vacation Rental. We looked them up and it was a service who finds a condo in the European city you wish to visit, arranges for transportation to and from the airport and suggests various special tours, info about the city, getting around, etc. How it works is that the owner actually goes to the city and suite in particular and investigates it first hand. If it meets a certain standard, she puts it on her website. Also, we don’t pay her a direct commission; it comes out of what we pay for the rental and other charges. We contacted Carina, the owner, she asked for dates, a budget and where we wanted to go. Italy, just Italy is all we gave her and she came up with four days in Rome, a week in Tuscany, a night in Verona and four days in Venice. 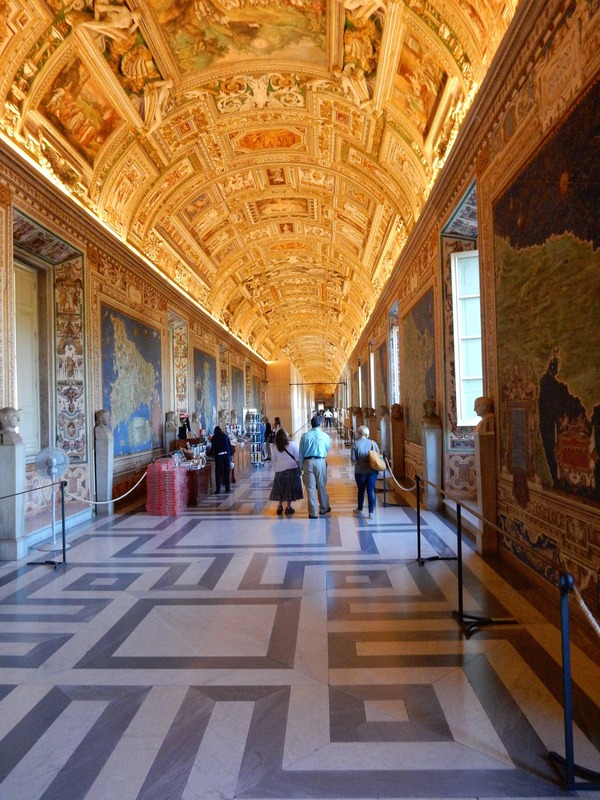 We’d be driven from the Rome airport to a central (very central it turned out) condo to basically do what we want with the exception having a private tour of the Vatican arranged for us. Then, we’d be driven back to the airport area to get a rental car and drive to a villa in Panzano in Chianti to stay the week. Then drive to Verona for a night then to drop off the car in Venice and a stay for four nights and driven to the airport to leave Venice. I won’t mention how much it was, it was a lot, but worth every cent! In late 2013 Deposits were given, places and dates reserved, car rented and we went to her suggested travel agent for the air transportation. All we then had to do was wait. Finally the time came to pay the remainder a few months out, and the day came! 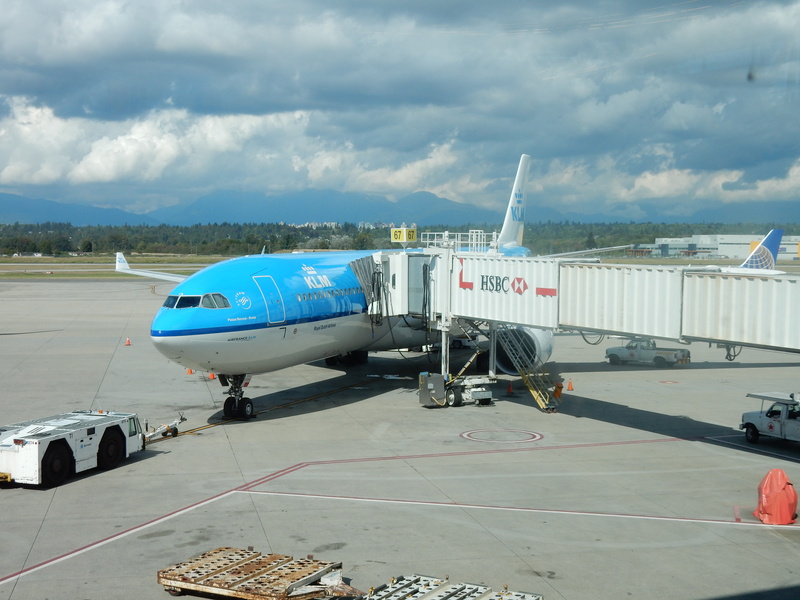 We flew KLM from Vancouver to Amsterdam. Good seats in Economy Plus from which we paid extra (apparently more leg room, but certainly not any wider!). At a bulkhead so no seats in front of us with tons of leg room luckily. Uneventful flight and got off in Amsterdam to a very crowded airport. 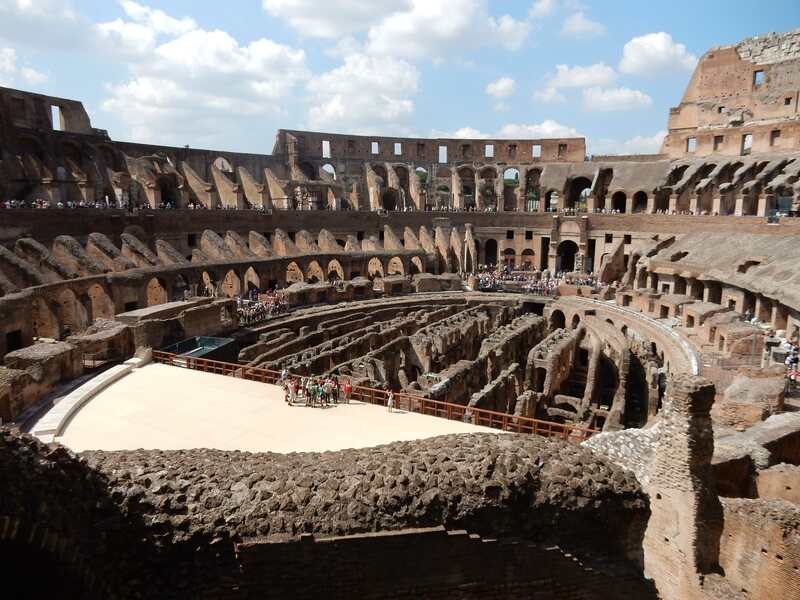 I was sweating a bit as we only had 1.5 hours between flights, so a rush to our gate but then we had to go through some strange customs check to get to a gate to catch an Air Italia flight into Rome. Delayed! Luckily, I guess. I had to buy a phone card to phone our contact in Rome to let them know we’d be late. Luckily we paid attention to the notes on the airport signs as they didn’t announce the Rome flight, nor any announcement for boarding either. We could only tell by the long line of people at the gate. I figured it’d be okay to get at the back as we have a seat. However, when we got to the gate they said we have to check our two carry on baggage. What? Why? Overcrowding! There was no overhead bin space. My wife was beside herself. They took them away and we boarded. To find tons of overhead space by our seats! We noisily brought this up with the flight attendants and the person who originally took it from us to no answer. It was a bit of a scary flight, mind you with a wider seat than the KLM flight from Vancouver. The plane made a lot of scary sounds I’ve not heard on a plane before and seemed to rattle and roll a bit too much. But we landed in Rome shaken and stirred. Then more fun. We made our way to the baggage carousel where our initially checked baggage came. And we waited and waited for our checked carry-on. And waited, and waited. We finally had to split up and my wife went to meet the driver who’d already been waiting a while. I meanwhile went to the Air Italia booth to register a complaint. As I was doing this my wife showed up and said our baggage is there! So on and out of the airport. The driver was courteous and fast! 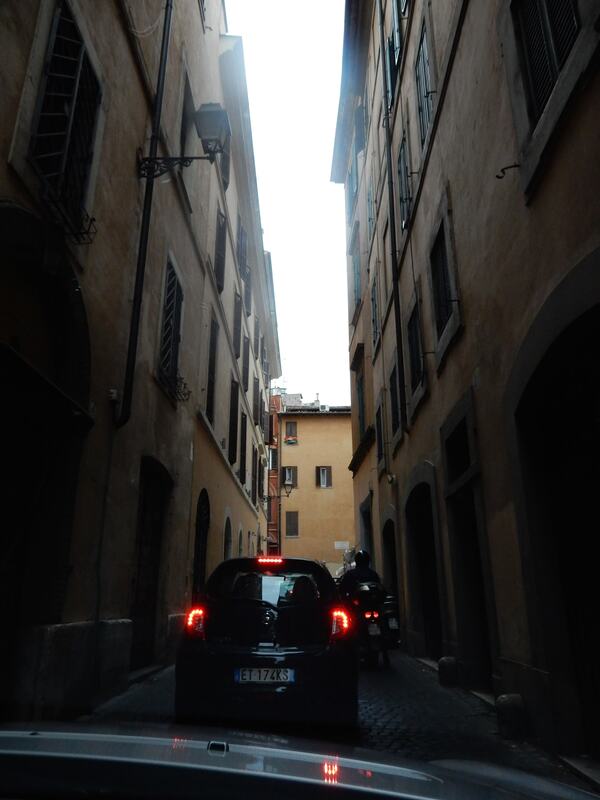 We snaked our way out of the airport to the roadway and into central Rome. As things were passing by rather fast I glanced over to look at the speed and the needle was at 200! My wife was white knuckling it in the back. Grin and bear. Grin and bear. We made it into Rome and the postcard sites. Wonderful! But I was questioning why they drew lines on the road. Absolutely no one was paying attention to them. They’d be three wide in a two-lane. The scooters, a brave lot. They’d pass on the left and right no matter what lane you were in. It was a beautiful kind of chaos. It seemed to my Canadian eyes they’d be an accident any moment, but there never was. People just seemed to know what the other was doing and while the space was narrow, they kept it away from each other with an instinctual precision. The frequent traffic circles were an example in instant diplomacy. You’d enter and be in charge until you left. Very interesting. The lady showed us around the neighbourhood. Tons of places to eat, grocery store, church, taxi stand, etc. She left and as my wife settled I went to a Tims store (a cell phone store) to buy three phone chips. One for each of our phones and a small iPad. Best hundred Euros I spent! The chips lasted the whole trip with data and phone capabilities. We used the iPad as our navigation via google maps. Especially as later we were going to drive across Italy! Carina suggested and we bought a map of Italy, but we never opened it. Everywhere, including in the tiny alleys of Venice, we found our way via the iPad. Oh how lost we’d be, especially on a particularly confusing section of road outside Verona (on our way to Venice) we’d still be there going round and round. I’ll tell you a bit of research beforehand via Google Maps street view can go a long way for a visual person. On street view I wondered the streets around the Rome condo, the Tuscany village and Venice too. This went a long way to cement in my mind what to expect and key points to go when needed. Saved us a ton to time! We were exhausted, but we stayed up as long as we could to adjust to the nine-hour time difference. 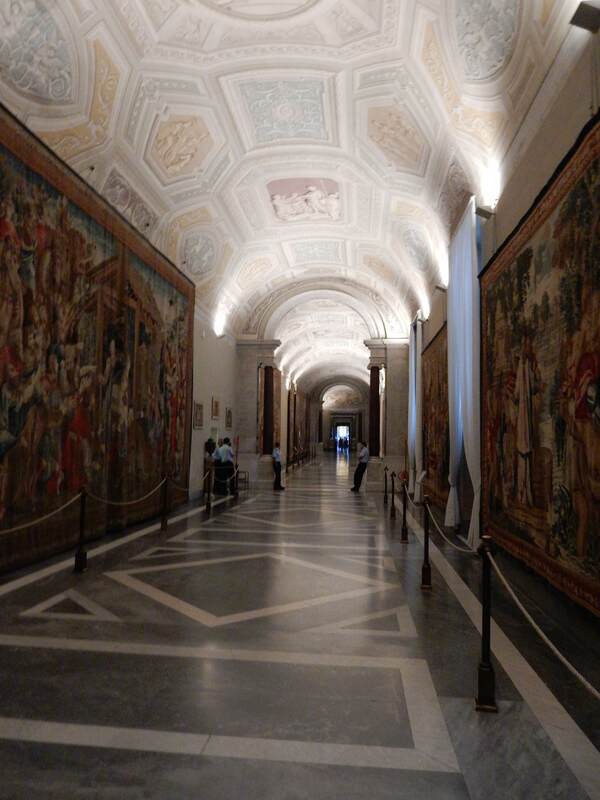 Especially as the next morning it is up at 6:00 am for a tour of the Vatican Museum gate for 7:30. Up and to the taxi stand for a 15 minute ride to the Vatican. 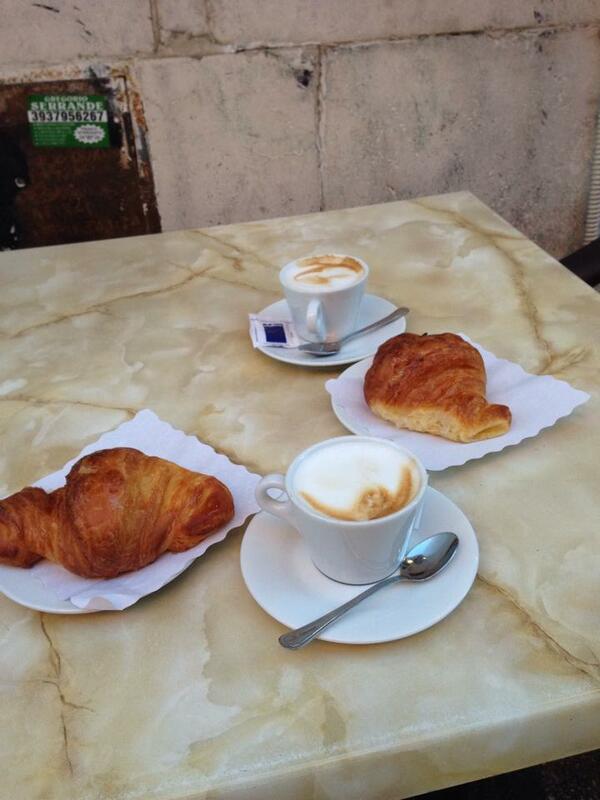 We arrived early and picked up our first coffee and chocolate croissants in Italy! Onto the tour! This lady working for a tour firm met us at the gate with a long explanation of the history of the museum and Vatican. I must say here that I had an expectation we’d be in early and before the crowds. I’d say about ten minutes before the crowds, so we kept a brisk pace to keep ahead of the thronging masses. We went in and was floored by the history, artifacts, and never-ending artwork. 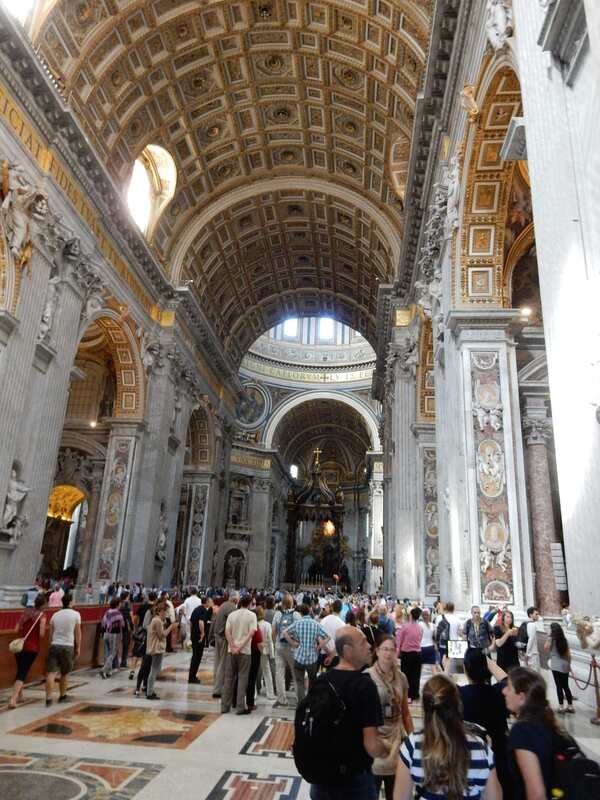 It was a long tour (about five hours) through the museum and ended in the Vatican itself. What a massive, massive edifice! I will add a caveat here. I’m not an organized religious person. Agnostic, I guess, if you want label. I was raised in a small town, in Roman Catholic observances. Which as soon as I could, shed for a more open-minded thought and considerations. I’d always kept the church at a distance. I respect the opinions and actions of those who practice the religion of their choice. Such as my wife who is very devout. Something I admire in her. Faith, as I’ve come to understand it, is personal and need not be crammed in (as it was in my youth), but allowed to flourish and nurture in one’s own time. Or not, if you so choose. This massive structure, literally a country unto itself, stirred an inkling of the doctrine forced upon me in my youth. Yet I wasn’t moved to devotion in any way. Frankly, it was a bit too much and the complicated (would be a long essay itself) political and hypocritical (in my view) over abundance of wealth that if the church truly followed its own doctrine, would be using such wealth in better ways (in my opinion). But it is what it is. It was all so very tiring, in that it was one glorious piece after another and after a while taking pictures became absently wont. We exited the church overwhelmed, exhausted, with throbbing feet. We went to a taxi stand and the six Euro ride there in the morning was now $18! A turn on our heel invoked a shout of $16! Then $12. My wife, shrewd as she is beautiful, said, “ten!” From the midst of the jockeying taxi drivers came a, “okay, come!” We gave the address and arrived at a spot a few blocks from the condo. But that was okay. A chance to see something new. That is the thing about going on such large-scale trips to foreign lands. You HAVE to let go of all preconceived notions, or want to find any home-based normalcy. See every corner and the trip as an Adventure! This will save you a ton of worry. Just go with the flow and how you’ll enjoy it all! We were informed the cities it was no problem as everyone spoke at least a minimum of English. In the smaller areas it was more difficult, but we got by with a minute amount of Italian. It helped to have an Italian language app on my phone. 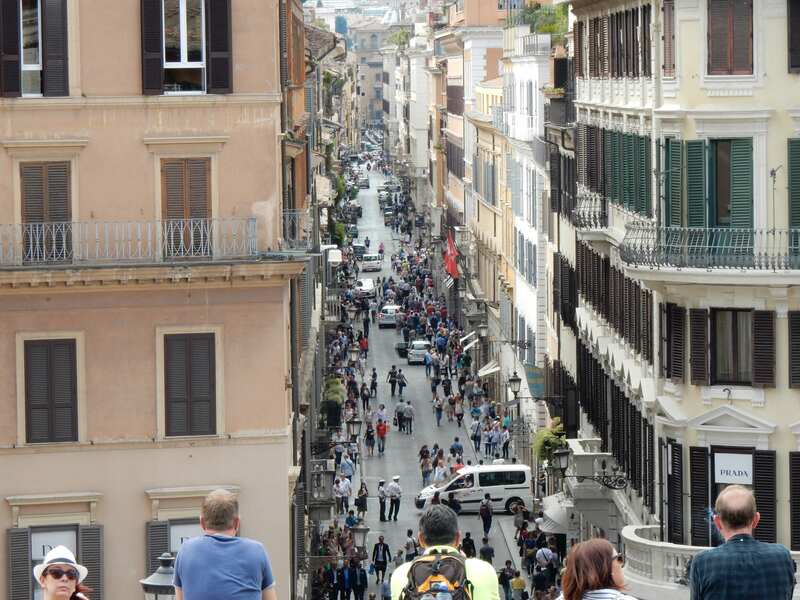 We walked though one of the countless squares in Rome, past many stores and sidewalk restaurants. A short rest and we went to a local bakery for more pizza. We found this pizza specialty of Rome, potato pizza! It was simply crust, olive oil and potatoes! You’d think it isn’t good, but it was wonderful! We had it many more times while in Rome. I swear one lady told us it was all over Italy, but we never found it outside Rome. Bummer. 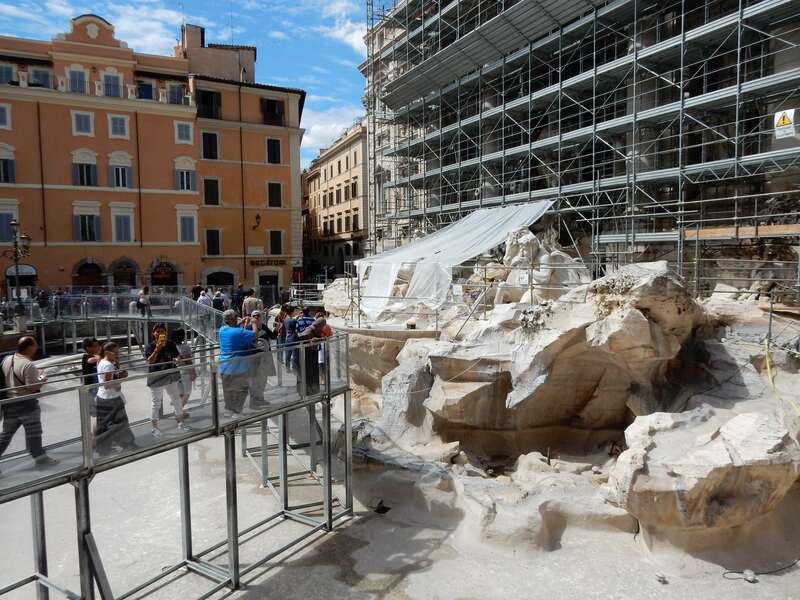 …finding great disappointment in the Trivedi Fountain being repaired (still threw a coin in anyway)! 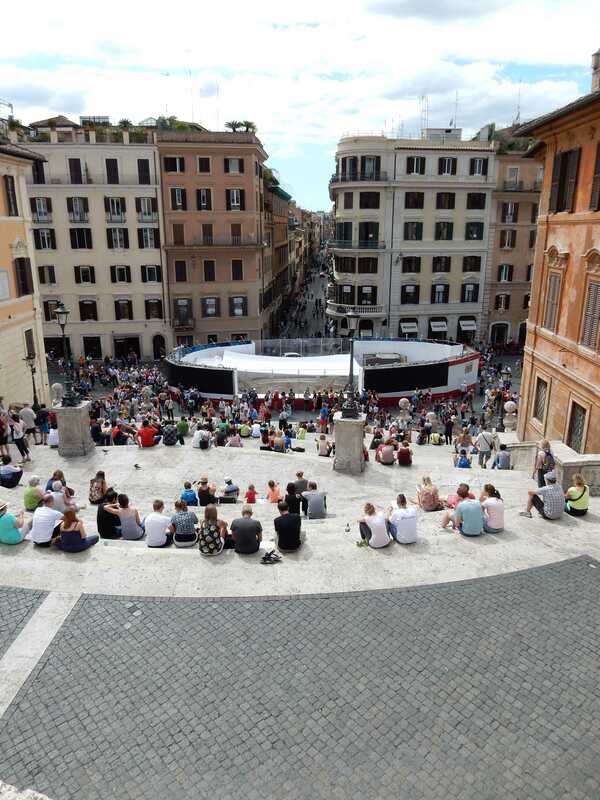 The iconic, through a bit disappointing Spanish Steps. Then through all the high-end retail of Via dei Condotti. 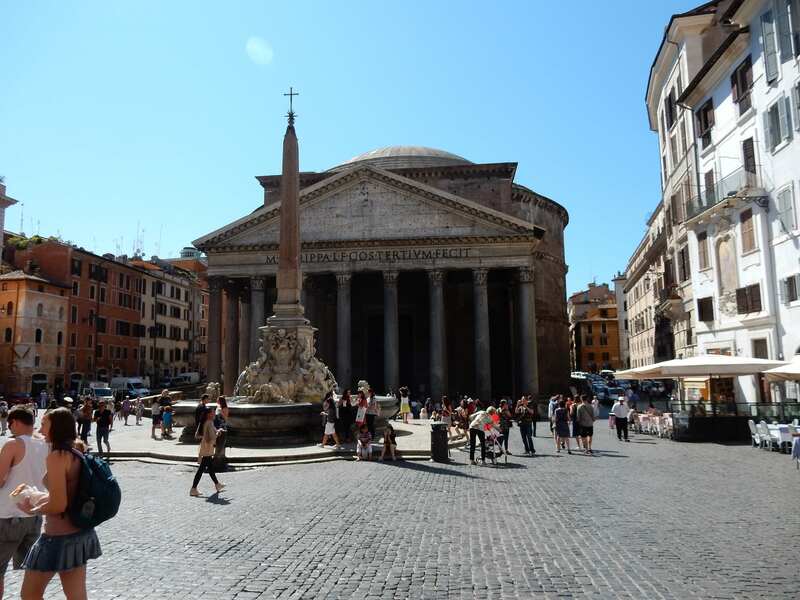 Back at the Pantheon area we found the best pizzeria just around the corner on Via Giustiniani, called “Super Pizza”. Recommend anyone to stop there! 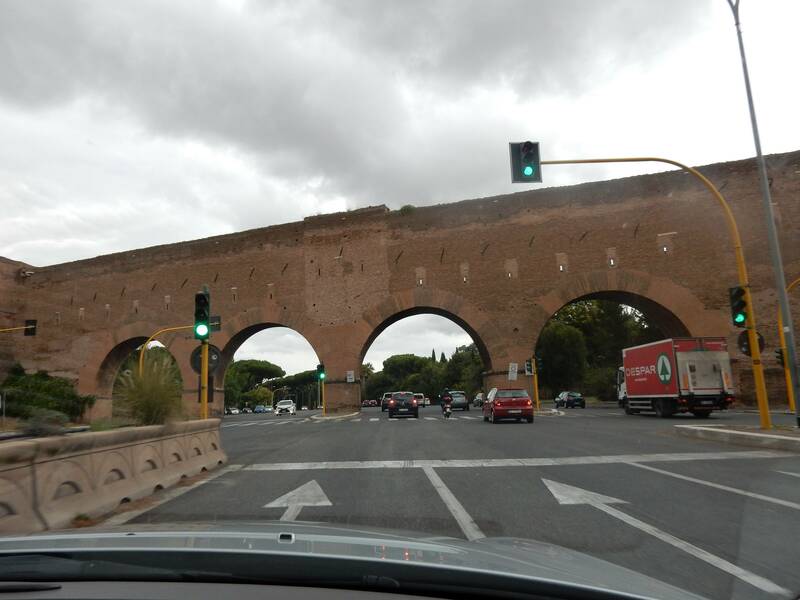 In watching my wife stop at store after store for her fashionable interests, I felt urged to buy some piece of Rome myself. Again near the Pantheon, I found this little bookseller. 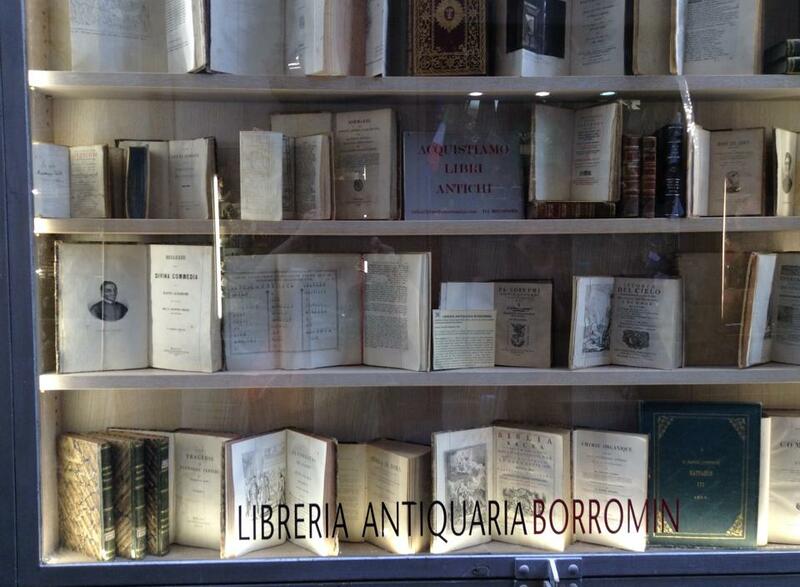 What attracted me was they were all very old books. In the window was a copy of the Devine Comedy. Having recently read this, I had to have it. Something, anything closer to the 500-year-old original would do! We went in and a kindly bookseller was there. I asked to see the copy and it felt heavy in my hands. Something about old books really gets to me. Not that I’d actually read it as it was in the original Latin. And 160 years old! It was on sale for $120 and my wife whispered to me, “say $80.” I did and he said no, no. I said, “$90.” Still no. I said, “final offer, “$100.” He hesitated then said yes and I now possessed an old book, the first I hoped for a large collection. 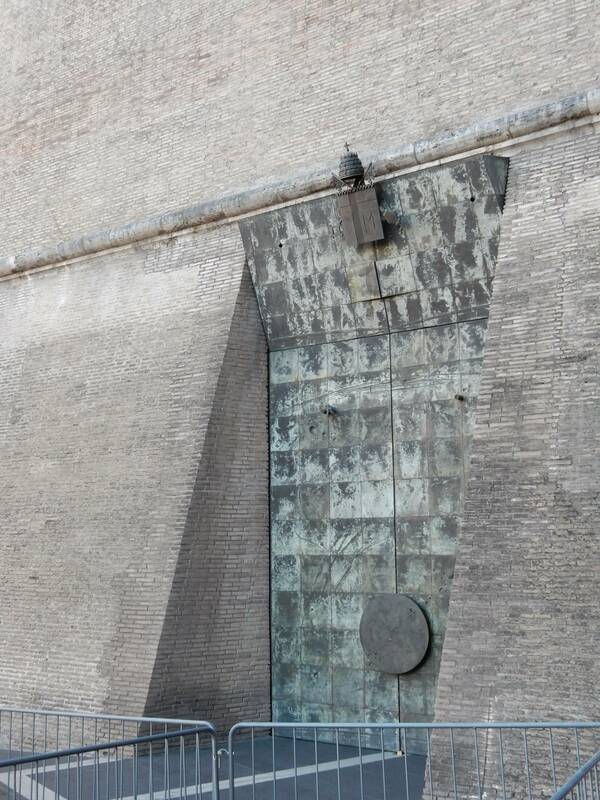 The next few days in Rome were the same. Wondering about. 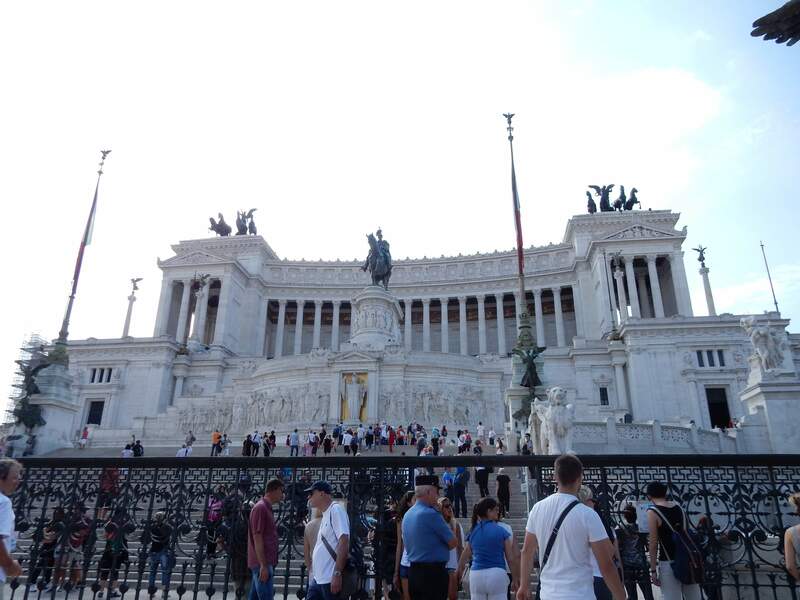 One day was a long walk over to the Victor Emmanuele II Monument then to and into the Colosseum. Terrific and terrible history. And the churches! 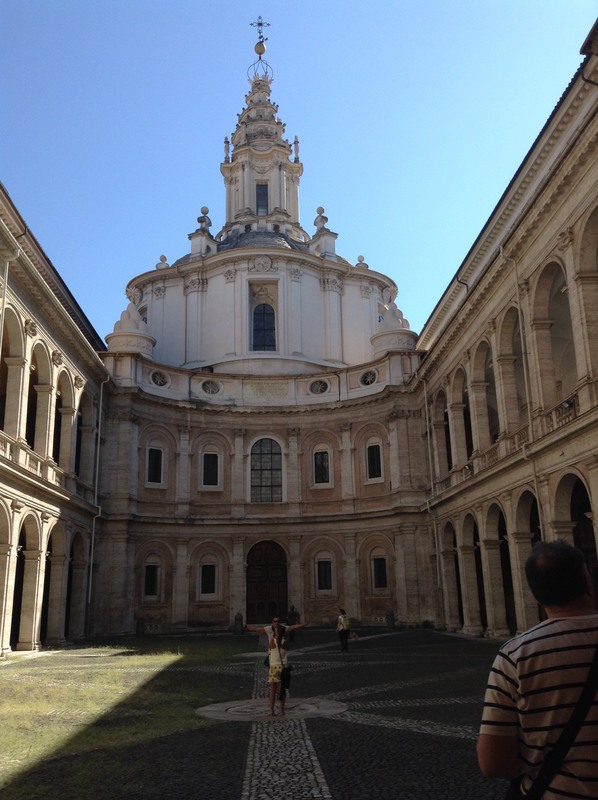 I swear around every corner in Rome (and most of Italy for that matter) there was a church. Often unassuming and seemingly in disrepair on the outside, on the inside always ornate and majestic. 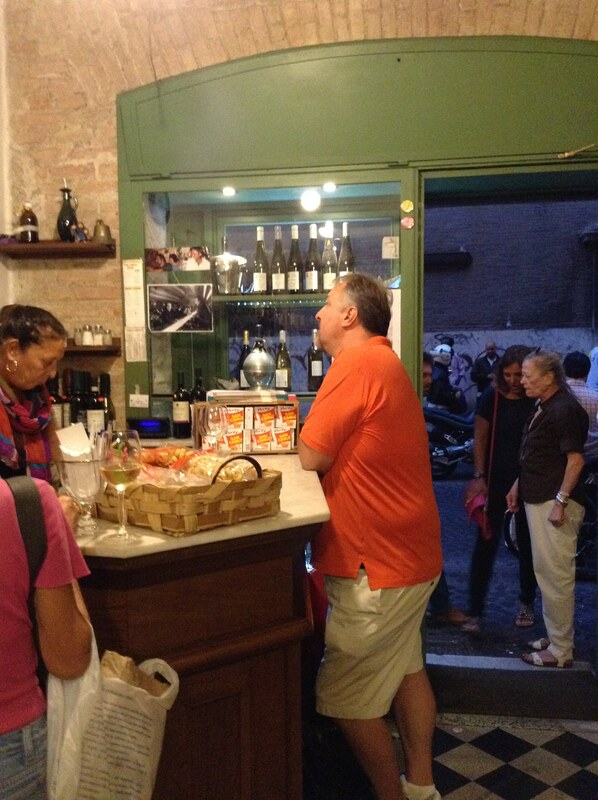 On our last night in Rome we went to a small standup wine bar. Had a nice glass, listening to the banter and jovial friendships of the locals. Then to sleep for the next day was off on another, greater, adventure of driving to Tuscany!